It was called the “war to end all wars.” Yet this month—marking the 100th anniversary of the first battles of World War I (1914 to 1918)—brings new headlines and sound bites about wars and battles. Images of wounded children, weary soldiers, and dead bodies haunt newscasts—on TV, computer screen, and smart phone. Our phones may have grown smarter, but it seems that we have not. We still wage war. In this centennial of what was once also called the “Great War,” an upsurge in graphic literature about World War I reminds us just how little is great about any war. Instances of heroism, acts of loyalty and compassion—all are eclipsed finally by the horrors of warfare. Some new graphic works about World War I point this out, as does the reissue in book format of a classic weekly comics series about that conflict. Still, the creators of one new graphic work were inspired by the overlooked heroism and patriotism of African American soldiers. 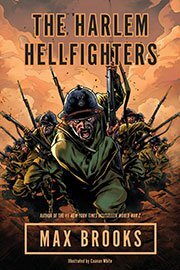 This reclaimed history of the United States’ shorter, later involvement in World War I (1917 to 1918) is the focus of Max Brooks and Canaan White’s The Harlem Hellfighters (2014), which I will discuss closer to the end of my post. First, I look at books concentrating on the entirety of World War I or its earlier years. 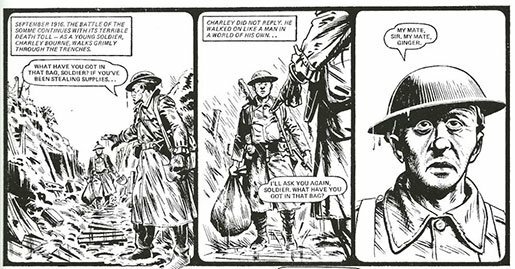 “Charley’s War,” written by Pat Mills and illustrated by Joe Colquhoun, first appeared as a weekly series in the British comic book Battle. The likeability and vividly terrible experiences of its central character, 16 year-old Charley Bourne, soon made this series the most popular part of Battle. Between its first appearance in 1977 and its conclusion in 1986, each 3 to 4 page long episode of “Charley’s War” was eagerly awaited by readers young and old. The talented team of Mills and Colquhoun (that’s pronounced “Col-hoon”) made it painfully easy to identify with naïve, patriotic Charley, a British working-class kid who lies about his age to enlist in the middle of World War I. Unlike the typical comic book soldier, Charley was shown with his family in daily life, and letters and post cards from and to his London family became a movingly ironic part of the series, as Charley struggles to stay in touch yet also spare his family from the warfare horrors he is experiencing. This series—with the addition of illuminating essays and interviews by its creators and historians—was reprinted in 10 volumes between 2004 and 2013. Those volumes follow Charley, along with his family and acquaintances, from 1916 through and past the end of the war, concluding ominously with Hitler’s 1933 election as Germany’s chancellor. They are still in print. Yet I am pleased to tell you that the first three books are being reprinted as one compendium volume later this centennial month. 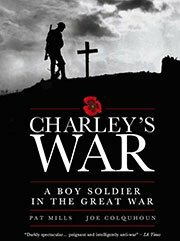 Retitled Charley’s War: A Boy Soldier in the Great War (2014), this compendium gets my strong recommendation, particularly since its publisher’s description indicates it will include many of the first volumes’ fascinating background essays. Tardi’s earlier It Was the War of the Trenches is dedicated to his grandfather, whose experiences in World War I inspired the book. 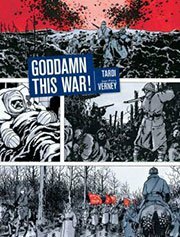 In his Foreword, Tardi writes that his book is not meant to be history, nor does it try to follow one protagonist or show “heroes” or a “collective adventure.” For Tardi, as for the ten or so soldiers whose experiences he depicts, war is “Nothing but a gigantic, anonymous scream of agony.” This graphic novel’s words and black-and-white images are strongly moving, but its phantasmagoric shifts from one character’s experiences to the next do not provide the typical linear narrative. That may disconcert readers who want or expect that sort of clear-cut story line. As Tardi’s final, devastating panels show, though, even what should be a clear-cut ending to warfare is death-dealing horror. Battle continued on November 11, 1918, the day that the Armistice was signed at 5:00 A.M., as its ceasefire was not scheduled to take effect until six hours later, at 11:00 A.M. Under a timestamp of 10:45 A.M., Tardi’s final, grim panel depicts entrenched soldiers still being blown to bits. Despite Tardi’s denying being a historian here, both of his WW I works note with historical accuracy how France conscripted its colonial subjects as soldiers. 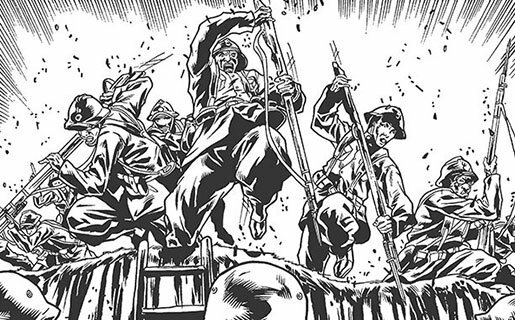 Black troops from Senegal, Morocco, and Algeria are among the soldiers Tardi shows fighting and dying for France, even as some French officers treat these men with racist disdain. Joe Sacco’s The Great War similarly depicts turbaned troops from India marshalling as part of Britain’s armed forces. Charley’s War also shows how the British and French military commands sometimes sacrificed Black or Brown colonial troops with even less thought than they gave to Caucasian soldiers. Furthermore, in a background essay, Pat Mills reveals that one of the few times editors censored Charley’s War was when he wrote scenes depicting U.S. Army officers denigrating their segregated African American battalions, typically relegated to service roles. http://exhibitions.nypl.org/africanaage/essay-world-war-i.html Mills’ editors removed these supposedly “inflammatory” panels. 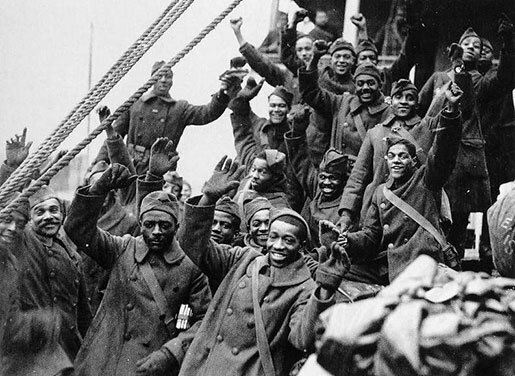 It is the little-known battle history of one of these battalions—the 369th Regiment, known as the “Harlem Hellfighters”—that inspired writer Max Brooks to reclaim this bit of African American history. As this centennial year progresses, readers will see more graphic works published about “the Great War.” I am particularly curious about Line of Fire: Diary of an Unknown Soldier—September, 1914 (2014) illustrated by French artist Barroux because its publisher claims this edition of a found, real-life diary is suitable for 8 to 11 year olds. I also have in my library “queue” a graphic anthology of World War 1 war poetry, illustrated by various artists: Above the Dreamless Dead: World War I in Poetry and Comics (2014). But I have to admit that the barrage of war-torn evening newscasts is making me more eager to turn next to lighter graphic fare—rest and recreation that, right now, is beyond even the dreams of those people whose lives, tragically, are the evening news. This entry was posted in graphic novels and tagged African American soldiers, Canaan White, Charley’s War, Goddam This War, graphic novel, It Was the War of the Trenches, Jacques Tardi, Joe Colquhoun, Joe Sacco, Max Brooks, Pat Mills, The Battle of the Somme, The Great War, The Harlem Hellfighters, World War I. Bookmark the permalink.